Benign Prostatitc Hyperplasia (BPH) - PSP94, what is it good for? When read together, these five studies suggest an intracellular fungal infection is causing BPH. "PSP94, what is it good for?" explores the hypothesis that an intracellular pathogen targeted by PSP94's C-terminus is causing BPH and prostate cancer. 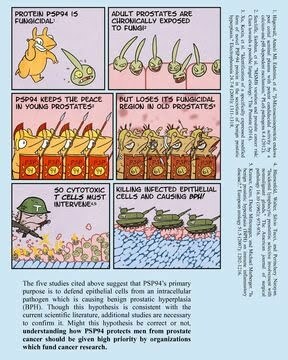 Since PSP94 is only fungicidal within epithelial cells (where calcium ions are absent), the existence of an intracellular pathogen targeted by PSP94 is highly probable. The loss of fungicidal activity of PSP94 in BPH and the resulting immune response targeted toward an intracellular pathogen directly tie BPH to an infection normally kept in check by PSP94. 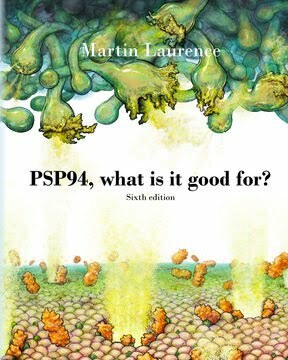 The prostate cancer literature also indicates that PSP94 keeps a chronic infection in check, as increased PSP94 concentration in the prostate protects from prostate cancer in a concentration dependent manner (see Home page).